Can be installed directly on irregular base. 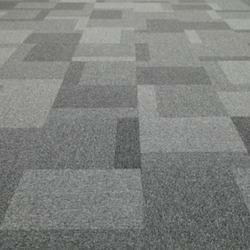 We are leading manufacturer and supplier of Carpet Tile. The provided carpet tile is designed using optimum quality raw material and progressive technology by our skilled team of professionals at our advanced manufacturing unit. Offered carpet tiles are textured in alternative colors in different blocks, which make its look simply great. Moreover, our offered Carpet Tiles are made available in different sizes and colors at economical prices. 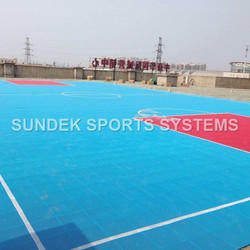 The PP Modular Tiles offered by Sundek Sports Systems, is very reliable and durable. After this flooring the participants feel very comfortable to do any type of action. These floorings are made using by high grade of material. 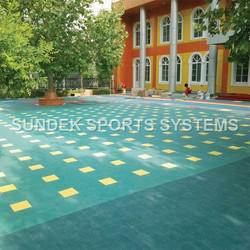 Outdoor Multipurpose Flooring are offer at most reasonable prices. 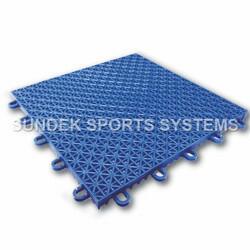 Assuring durability and high skid resistance, these floorings are ideal for children play areas, parks, multipurpose areas, tennis, basketball, racquetball, handball, volleyball, tennis, badminton and so forth. Clients can lay down these PP Modular Tiles on different kinds of surfaces, including hard concrete, soil, wood and tarmac. 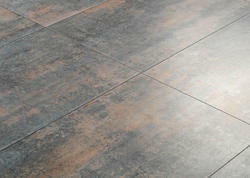 To meet the variegated requirements of the clients, we offer these floorings in various colors. PP Tiles floor tiles has become popular due to the fact that it is one of the most durable outdoor floorings available and gives customers a lot of flexibility as the product can be configured in different design patterns and it can also be moved around if required. 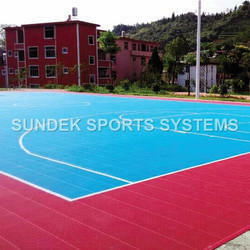 The portability gives the floor big advantages over other outdoor sports flooring products. With sheer hard work and determination, Sundek Sports Systems has positioned itself as the most preferred name in the market for providing Sports Tiles to our revered clients. With the wide knowledge gained by us, we use the best of techniques and machines, under the guidance of our adept professionals to provide the prompt, reliable and flexible services at clients end.